Powers/Abilities: Power Man presumably possessed the ability to focus his chi into his fist by utilizing the Iron Fist, like his Earth-616 counterpart, and he wore a cybernetic exo-suit that granted mobility to his crippled body. Misty Knight possessed a bionic arm like her Earth-616 counterpart, albeit as Iron Fist, the arm was more powerful than her previous bionic arm and was equipped with various iron-laced weapons. History: (Marvel Knights Millennial Visions 2001 - "Role Reversals" (fb) - BTS) - Following a crippling battle between the mercenary Heroes-for-Hire and Juggernaut, Danny Rand retired as Iron Fist and ended the Heroes-for-Hire, cutting off ties with his old partner Power Man (Luke Cage). Preferring to spend his solitary time within his locked high-rise apartment, Danny spent time looking at the Manhattan skyline as Luke Cage continued as a hero with Misty Knight and Colleen Wing's detective agency, which was renamed Cage, Knight & Wing Detective Agency. While not as prosperous as when Danny Rand was funding their activities, Cage, Knight & Wing Detective Agency became a successful private investigating firm until they began investigating the international crime syndicate known as Terros. During an investigation into illegal weapons smuggling in Costa Rica, Luke Cage and Colleen Wing were killed in an ambush by an artificially enhanced Terros agent while Misty Knight barely escaped with her life. Making her way to Danny Rand, Misty Knight's bionic was begrudgingly upgraded by Rand to incorporate built-in iron-laced weapons. (Marvel Knights Millennial Visions 2001 - "Role Reversals") - With her new and improved bionic arm, Misty Knight took on the codename of Iron Fist while the revenge-seeking Danny Rand donned a cybernetic exo-suit for mobility as the new Power Man. Together, the two sought revenge on the Terros organization. Comments: Created by Lee Ferguson and Livesay. 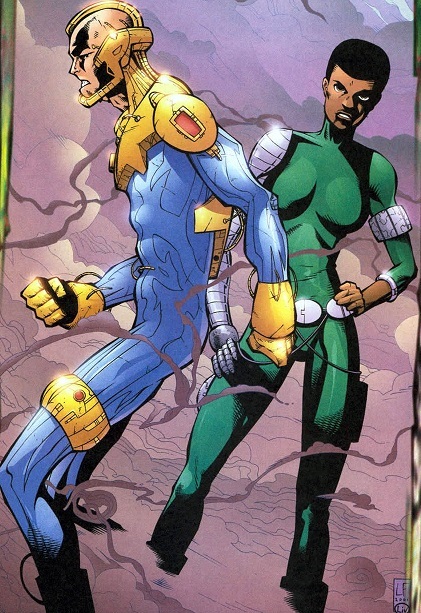 Danny Rand and Misty Knight's physical stats were presumably the same as their Earth-616 counterparts. The only confirmations were that Rand no longer had hair as Power Man and Misty Knight had the same brown eyes and black hair.